Message #1 Posted by Walter B on 16 Nov 2013, 5:53 a.m. Still pondering whether I should put the arithmetic functions to the left. Don't talk about it - do it. Trying to make a fuss about it again? I thought the discussion about the placement and order of the arithmetic keys was over. There were so-called polls related to nearly every aspect of the keyboard layout, and the results were clear. Those polls are to be regarded like market research: the results are interesting but in no way binding for the developers. E.g. I won't release a design I'm not convinced of. There may be polls within the team having a totally different relevance. Those polls are to be regarded like market research: the results are interesting but in no way binding for the developers. Edited: 16 Nov 2013, 8:12 a.m. The display is monochrome because that is what is commercially available in the necessary size, high resolution, and high contrast. Those of us doing the hardware development don't have anywhere near enough funds available to have a custom graphic display made; that costs hundreds of thousands of dollars of NRE. We've already spent many thousands of dollars on this project, and will have to spend many more to bring this to market, with no real expectation of ever recouping the development costs. If we're very lucky, we might come close to not losing our shirts. This is a labor of love, not normal product development. If anyone thinks that manufacturing calculators for a tiny niche market (which is, let's face it, what our community is) is a good way to make money, I'd strongly advise them to reconsider. It's a great way to make a small fortune, only if you start from a large fortune. That said, there is no technical issue preventing another team from developing alternate (better?) hardware on which to run the WP-43S firmware. Richard Ottoman and I have publicly demonstrated the latest version of our hardware, running a modified version of Free42. We are researching a few minor changes to the hardware design before we have another small run made, which will be provided to the firmware development team. These will use Richard's folded mylar case, and once they're completed I'll return to working on an injection molded case design. A local entrepreneur has given us advice on a way to get started with injection molding for a fraction of the normal cost despite our low volume expectation. 1. It would be interesting to know/understand the human factors research that was done on the HP35 (in the 1970s) that led to the arithmetic keys being below the Enter key. Granted that the 35 key layout may have been oriented to the right-handed user. 2. Given the symmetry of the keyboard layout you've shown, perhaps the location of the arithmetic keys could be defined by the software load. The arrangement of key functions can certainly be rearranged arbitrarily by firmware modification. The constraints are that for manufacturing a specific layout has to be chosen, and the ON key will likely be physically different than the others (low profile, like the 12C), so at some point the decision on where it is located has to be finalized. As Walter points out, polls are conducted as market research, but the actual decisions of all aspects of this project are made by the people who actually perform and/or fund the specific work (hardware and software development tasks). This project is NOT a democracy. Anyone unhappy with that can start a competing project run as a democracy, and see just how well that works out. This project is NOT a democracy. Now I'm confident that something will actually be produced. From there on I didn't participate in any other poll on the 43S: what are they for, since they can always be reissued? My apologies Walter, but I don't recall the discussion on the non-yellow shifted digit positions. No problem, Gene. It was Pauli's idea leaving the f-shifted digit labels free for reducing clutter. So far, there's no need populating them. Each and every label (except USER) may be reassigned by you. The labels underlined will call menus of softkeys. Each menu will stay on the screen until another one is called or it is EXITed explicitly. I hope I didn't forget any key feature. It wasn't the result of the "first poll" as such, it was how the poll was handled by the initiator. Actually the first "poll" wasn't recognized as "poll" by many due to a misleading title, and the initial run time was, errr...not very user friendly. what are they for, since they can always be reissued? I'd like that (but I'm right-handed, too). If LEFT = RIGHT and RIGHT = WRONG then holds LEFT = WRONG as well ;-) Rats, the world is complicated. Maybe STRAIGHT is better though it must not be RIGHT. Edited: 16 Nov 2013, 4:59 p.m. I would prefer the arithmetic functions to be on the same side as the Enter button. 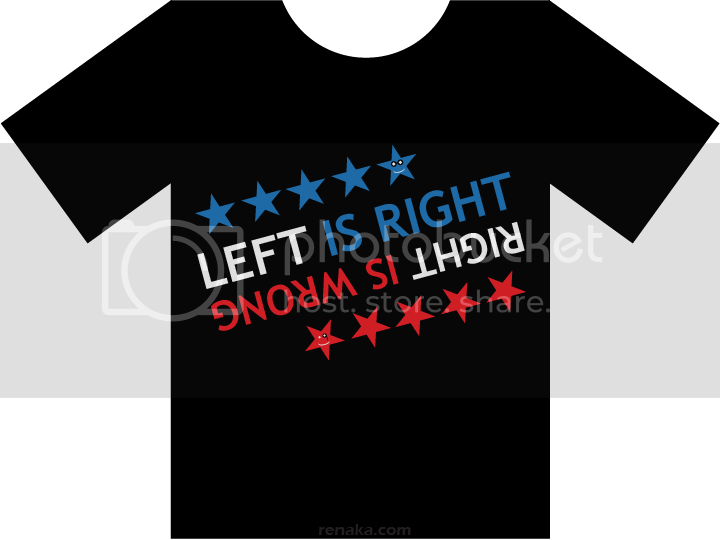 I'm neutral as to whether that is left or right. Exactly so! There is absolutely no advantage, ergonomic or otherwise, gained from ENTER being in any other column of keys other than above the arithmetic keys. I suspect that those of opposite outlook are relatively recent HP users who gained their early experience with HP calculators after HP's gross ergonomic error in the post-Voyager RPN era of separating the ENTER key from the arithmetic keys. That design error has become viewed as normal and natural, efficient and essential. The exact opposite is true. I don't care one bit which side of the keyboard these keys appear. But these keys must always be on the same side in any well-designed layout. I'd agree with that. It always seems strange when doing arithmetic to enter the first number using a left-hand key and the next number using a right-hand key. Which side? I'd go for the left. It's the traditional side for the Enter key, whereas the arithmetic keys have varied. Also (for a right-handed user), the Enter and arithmetic keys are more visible there, and closer to the index finger which I think is the most natural finger for entering a number. Edited: 19 Nov 2013, 4:00 p.m. I will work on the alpha positions for you if the keyboard layout is acceped. Edited: 16 Nov 2013, 6:57 p.m. But seriously, the 42S keyboard layout was nearly perfect, except maybe for the Alpha chars. So why not simply take one of the best keyboard layouts (HP-42S) and add the newer menus? But seriously, the 42S keyboard layout was nearly perfect, except maybe for the Alpha chars. Well, I have been using a 43S with an 42S keyboard layout -- and while I can tolerate the arithmetic functions on the right, I still prefer them on the left. By the way, I am a "one-hander" and operate the calculator with my thumb while holding it in my left hand. As for the alpha entry, I have never had a problem with the way it was done on the HP41C. Me neither, but as I understood, the 43S doesn't have an Alpha mode like the HP-41, but rather an Alpha entry similar to the 32S, for variable names (single letters) and such. But since the old keyboard discussion was digged out, maybe even the Alpha activation mechanism could change again. As someone indicated: Maybe it would be best to offer some different configurations, with default keyboard layout defined at compiletime. This would void any keyboard "discussions", and everone should be happy. So, so. Guess why there is an [alpha] key on the keyboard of the 43S? Obviously your speculation is wrong. Maybe it would be best to offer some different configurations, with default keyboard layout defined at compiletime. This would void any keyboard "discussions", and everone should be happy. Offering the hardware in different variants would raise costs to infinity IMHO. No, Sir, the 43S will have one startup default keyboard layout - everything beyond is a matter of assigning and attaching overlays and/or stickers for user mode AFAICS. So when it comes down to production cost, it would be advantageous not to ignore the "market research" already done. Though perhaps it would be better to have the f and g keys on opposite sides of the keyboard? That might reduce the chances of hitting the wrong shift key by mistake. Big Brother: I want the whole pie! Little Brother: We should split it half and half! Big Brother: No! I want the whole pie! Little Brother: No! We should split it half and half! Mother (Statistician): Let's compromise. Give your little brother 25% of the pie. Put one foot in a tub of boiling water and the other foot in a tub of ice. On the average you'll be comfortable. "daughter; you slice the pie into equal portions. son; you pick your slice." Yeah, nice to have the enter in the center. But I've got a data point. I'm left handed so hold the calculator in my right hand. I like having the enter and operators along the right so I can push them with the thumb of my right hand. Which keys are most easily reachable with that thumb? Left or right? That's the side where Enter and the arithmetic keys should go. I'd assume that this would be to the left? Sorry to all the left handed people out there, who would have to reassign and relabel. I do know this ls unfair but I want the most usable calc for as many people as possible. EDIT: Me wonders, is there at least a consensus in this forum that ENTER and arithmetic keys should be on the same side of the number block? I appreciate the handedness of the keyboard. That is why I prefer the arithmetic keys and the Enter key together on the left side of the calculator where I can reach them easiest with my left thumb. As stated earlier, I can run the 43S prototype one-handed -- it has the HP42S layout with the arithmetic keys on the right. I should note that I have fairly big hands and my thumb just barely reaches across the calculator comfortably. For reference, the bent Mylar case is about 66 mm (2.6") wide by 155 mm (6.1") long by 14 mm (0.55") thick and weighs about 100 gm (3.5 oz). The HP30B weighs 115 gm (4.0 oz) and is 77 (3.0") x 149 (5.9") x 16 mm (.63"). BTW, has there been any discussion regarding single- and double-click (on yellow/blue keys) for fundamental and inverse function....Square/square root, sin/arcsin e/ln and so on? If so, please direct me to the tread where that was discussed. has there been any discussion regarding single- and double-click (on yellow/blue keys) for fundamental and inverse function....Square/square root, sin/arcsin e/ln and so on? Not yet. Generally, however, we don't want to abuse our Parkinson abilities - and remember the discussion about double registering keys some time ago. Double-registering keys are a hardware problem - but not to be made necessarily into a design restriction. Double (and triple) [SHIFT] pressings works like a charm on the 41Z, SandMath and PowerCL U/I's - FWIW. Left or right? Right or left? Let's try to elevate ourselves to a higher state of mind, above petty differences. How about putting arithmetic operations on top of numbers, besides the Enter key, all in a row? The keys +/-, EEx, i, and backspace would make up the rightmost column (bottom to top), bringing together in a 4x4 square all the keys used for number entry, and putting arithmetic operations closer to other mathematical functions. I started typing this reply tongue firmly planted in cheek, but now I'm starting to take myself half-seriously. What do you think? Argg!!! On the right!!! I thought this was settled. I think it is perfect! Don't you be afraid. Sometimes opinions may change. A little market research after some nine months helps staying in touch with our potential customers. And it doesn't slow down product development at all but adds a bit of ... ummh ... entertainment while we're in the Prime desert (and seem to stay there for more time). FYI: I'm sitting on a 303 page draft manual - and for sake of progress just want to know where to put such elementary function keys. Obviously, both of these suggestions are based on my usage patterns-- maybe others would disagree. Either way, it's a very workable layout. I see some mental links of [Delta]% to +/- and FINance and also of [pi] to 3 -- I can't find a similar link of [pi] to FINance nor +/-, however. I was thinking solely of efficiency in finger travel. I hadn't thought of the relation to TIME and FINanace; maybe they could switch, too. 10 points to Gryffindor for the nice argument <|:-) Personally, I've no problems associating FINance and [Delta]% with [-] permanently ;-) and putting TIME next to COMPLX. Edited: 19 Nov 2013, 6:08 a.m. Thanks for your kind words, but please don't exaggerate. No changes in the upper rows. Edited: 20 Nov 2013, 1:57 p.m. "...In the suitcase on the left you'll find my favorite axe. Don't look so frightened, this is just a passing phase,..."
Then everything will revert to right, again. Edited: 20 Nov 2013, 3:41 p.m.
Also, why not make the keyboard modular so that people can just pull off the keys and place them where they want (other than the ENTER key, of course)? If your keyboard handler is set up to use pointers to for each key, it should not be that much more code to have users customize their keyboard. For example, the HP48 series had arrays of pointers for each key, and for each shift plane. I am imagining a bootup process that prompts users to press the F1 key, then the F2 key, etc. This would be done once, and can be accessed again through some sort of warmstart event and special key combination (e.g. the four keys at each corner of the entire keyboard). In the end, everyone has their own custom keyboard with the proper labels in the proper place, and the only thing left for people to grumble about is whether the ENTER key is on the left or right side. Edited: 20 Nov 2013, 3:06 p.m.
We show you a lot of the project but not everything. In this case, there was a small poll by private mail in parallel some days ago which lead to the decision published above. Maybe they (the developers) want to make a more informed decision on the layout after the users discuss the pros and cons of each before they vote in the "small poll by private emai in parallel" to the discussion. Except there was already a poll on this issue with the matter clearly decided. Moreover, even if one considers only the postings in this thread, I would still be inclined to think that the non-developer preference is for right-sided arithmetic keys. So (in my mind, anyway) the "discussion" here was not really intended for everyone's participation. Logistically speaking, you would have fewer "noise" posts to wade through if it were simply a matter for developers to discuss. As it stands, it seems a bit dishonest to invite readers in this forum into a discussion in which their input is irrelevant. I do appreciate the updates on the project; and I appreciate the reality that not all details can/should be released. That said, it would seem reasonable to ask why the developers (which I presume is much smaller in number to the readership here) chose for a layout that completely negates all previous polls/discussion/<whatever-you-want-to-call-it>. Also, why not make the keyboard modular so that people can just pull off the keys and place them where they want (other than the ENTER key, of course)? Aside from the ENTER key, the by-6 keys (top part) are a different size than the by-5 keys (lower part). It's not yet certain whether the digit and non digit by-5 keys will be the same size; on traditional HP models the digit keys were wider than the arithmetic operator keys. The EXIT/ON/OFF key may be very low profile, like the ON key on the 12C and 71B. It hasn't yet been determined whether the top case will be heat staked to the PCB. I'd prefer to use screws, but miniature thread forming screws are amazingly expensive. Even if they are used, they are only good for a few insert/remove cycles. Also there probably won't be much depth for the threads, and even so it will make the calculator thicker than it could be with heat stake construction. The point of the polls and such is that if it is to be offered as a product for purchase, there has to be a standard key layout. However, aside from the previousl described physical constraints, there won't be anything in the hardware or software design that prevents you from rearranging the keys as you like. Of course, it will also be possible to apply vinyl stickers like Eric Rechlin makes for WP-34S. We could also offer a "blanknut" version (at an even higher price), if there was any demand for it. I don't think the issues here were so much about placing the numeric keys up where the non-numeric keys are, and vice versa. In fact, I imagine that only a few keys would really ever be moved around. I never really saw the point of this given that most calculators will likely have a cover, and (if properly designed) will have auto-shutoff even if the ON key were accidentally pressed. Is there another issue that is resolved by having the lower profile that is not resolved by either a hard case or auto-shutoff? I'm not planning to design or sell a cover for the DIY543 hardware. The purchaser is obviously welcome to find or make a suitable case or cover. The point of the low profile ON key isn't just that the calculator doesn't inadvertently get turned on, but that it doesn't get turned on and random other things happen, like inserting or deleting program steps, or altering the contents of registers or the stack. Nice work! I'm wondering would it be feasible to design the dimensions of the case so that it would fit a good commercially-available cover? I'm not familiar with that market so I don't know of any, but if something like the (gasp!) 35s's nice-quality slip-case was easily available on its own, that would be a perfect solution. I used the 48, 49, and 50 for years, never treated them especially carefully, and never so much as scratched a display, let alone broke one. However, there have been many complaints in various forums from people who broke their displays and were upset that they couldn't be replaced inexpensively (or at all). I'm not sure what kind of abuse people were heaping on those poor calculators, and maybe somehow they had gotten the idea that they were indestructible, but LCD displays are fundamentally fragile, and the larger the display is, the easier it is to accidentally damage it. The DIY543 display is quite expensive and I definitely don't want people expecting me to replace broken displays under warranty. Cell phone vendors seem to take the position that display damage is not covered under warranty, and I'll attempt to do likewise, but perhaps I should consider designing a cover to supply with it. On the other hand, given the cost of the DIY543, the (small) market for it is probably mostly people who will take reasonable care of it. The layout presented here is ignoring nearly everything again. It's not as "ergonomic" as the layout of the HP-41, and it's not compatible to the layout of nearly every (HP and other brand) calculator after the HP-41. Oh well, after all this mess with so-called "polls" which are ignored by the initiator anyway, thus now looking like wasted time, it seems to be the time to withdraw interest in the so-called 43S. If the arithmetic keys will be on the left side, as in the post from 20 Nov 2013, 1:56 p.m., I simply won't buy such a unit. Plus and minus should be swapped, but still, I'm interested :-). I'm quite neutral on the side of the arithmetic keys as I've said in a previous poll. I'm using and enjoying calculators with both layouts. Why introducing a new layout and not just choosing one of the two existing ones (a choice which by itself is already generating hot discussions...)? One thing is the order of operators and the other thing is their location as a group - and both decisions are independent in principle. The order + - � � (bottom up) or better + - � / (enhanced visual contrast) is what we all learn at school. The order / � + - sounds like "we are different and want to emphasize it for sake of emphasis" to me -- especially with the background that that order doesn't seem to have a striking reason (according to another thread and the links therein, + and � are used more frequently than - and / but that could result in - + � / as well and doesn't outweigh common order of operators IMHO). Well, what I learned at school was " � � + - " as I had a math teacher who taught us RPN & programming on the hp 25 (we had one calculator for 2 students provided by the school at that time). All depends on your goals: if you want to align on what most people are used to in school it should be " + - � � " on the right side. But I think that the bulk of the future 43s users are people that have already a long experience of using hp calculators, so existing layouts and usage should be taken into account. For me the order AND location of the keys are related when using a calculator. My concerns with " + - � � " on the left is that, as a regular HP-41 user, when accessing the arithmetic keys on the left side of the keyboard I�m used to find them in the " � � + - " order, so I would have to learn a third layout and when looking to the arithmetic keys on the left, have to manage a different key order for the 43s vs. my other calculators who have the arithmetic keys on the left side. I�m not saying this not possible (I�m not so old that I can�t learn new things ;-) ) but I don�t see the benefit of having the arithmetic keys on the left in an order different than all other calculators with these keys on the left. It�s not an issue so big that it would prevent me to get a 43s when it will be available (I like the 34S and I�m sure I�ll enjoy also the 43S), but as you started the discussion I wanted to provide my feedback as a potential future user. Looking at the layout again, I've got some concerns about the navigation buttons and exit being right -- no menu based calculator does that that I know of. It just looks wrong somehow. Hmmh, did you ever wonder why the cursors on you computer keyboard are on the right? Simply looks right. Nope: /, * (and -) are on top; why? The order ... + - � / ... is what we all learn at school. and I'm still convinced that applies to you as well. It means that you learned adding before subtracting before multiplying before dividing in primary school mathematics - and all of that a long time before you could even handle an HP-25. Thus I wrote about all of us. And thus I see the order + - � / as kind of 'natural' order of arithmetic operators, regardless of what any engineers of HP may have wanted to tell me in 1972. So, in light of this and if this was a poll and not a discussion, my vote would go to " + - � � " on the right for the reasons exposed above. Bien, so we agree on the order at least. Placing said group left or right is another question, independent of the previous one. In that case we cannot rely on mathematical curricula. Thus we decided it another way. This is not exactly what I said. Understanding what you mean doesn�t imply that I agree with the order independently of the right/left location. But if the order is defined as " + - � / " then I would like it to be on the right for consistency with my usage and daily experience. or something similar (top down). The reason why any key layout "make sense" is simply because we arbitrarily -- yes, arbitrarily -- put meaning into that order. Why is it that the operators should be read "top to bottom" and not the same for the numbers? Did you learn to read from the top of a page to the bottom, or vice versa? The reason having X on top and + on bottom is simply to have it align with the fact that the numbers also count from bottom to top. But again, even this choice is arbitrary, even if accepted as convention. And thus I see the order + - � / as kind of 'natural' order of arithmetic operators, regardless of what any engineers of HP may have wanted to tell me in 1972. From what I can see, you are willing to go against the grain only as it fits your own personal view because I am 99.99% positive you did not learn to read from the bottom of a page to the top (referring to the number keys). The other heavily discussed topic is the location of the arithmetic operators. Some folks insist they are on the left along with the ENTER key because they use their left hand and their thumb does most of the work. If that is the main reason for left-sided arithmetic operations, then why don't you also redesign the layout so that the most often-used keys are on the left? Even more logical would be to lay the keys out in as close to a "radial" manner, centrally focused at approximately where the thumb would be. What is just as interesting is how there is so much effort to make an efficient calculator through keyboard layout as well as RPN, and yet an even easier way to be more efficient is to actually use TWO hands when using a calculator (I use two thumbs to do most of my key presses). Much like pecking on the keyboard with two fingers is less efficient than touch-typing, I do not see a strong argument for using only one hand. You may present the idea of holding the calc in one hand and writing in the other. I don't know of very many people who simultaneously write (and presumably look at what they write), all while pressing keys on a calculator and making computations (and looking at the screen to make sure they pressed the right keys). Even if you do hold a pencil and one hand and calc in the other, you don't use these two tools in parallel. We do these two tasks serially -- compute, then write, then compute some more, and write some more, etc. So really, there is an advantage to putting that pencil down and holding the calc with two hands (if for no other reason than to not be as likely to drop the calc). Once you get away from using a single thumb, it is quite easy to see the merit in placing the arithmetic keys opposite of the enter key -- for the same reason the QWERTY and DVORAK keyboards don't have keys lined up alphabetically: faster input by pressing keys using the opposing thumbs every other button press. In the end, it _is_ your project. And if you want to make the calculator be a certain way, I see no reason why it should not be as you want it. I also do not see any problem in sharing your ideas and process by posting progress reports on the forum. The only issue I have is that sometimes the discussion is a bit dishonest wherein many other folks have been lead to think that what they think matters. A simple bit of disclosure (i.e. that the responses will in no way affect your decision-making) any time you ask for a "discussion" or "poll" would save a lot of folks time and emotion. In summary, just do it -- and share what you want to share. All these discussions and polls are just getting you sidetracked from the real work in getting your project completed. Edit: The layout for the number keys is likely due to a "natural" fit with the right hand on a PC keyboard. This likely got "imported" to desktop calculators (Or maybe it was the other way around?) and then left there as the calculators evolved to handheld form. So while you are rethinking where to put arithmetic keys, it may be a good time to also rethink number key layout (esp. since there is a preference to use the left thumb). Edited: 21 Nov 2013, 10:18 a.m.
Now I'd be curious to start a new "poll"... Given the recent left turn in the "keyboard layout" drama, how many people here are withdrawing interest in the calculator? How many are now willing to buy it who wouldn't have bought it with the previous layout? Any committments in such a customer 'poll' are as free as the ones in 'Bring back the HP-15C' some time ago. Just not worth the counting effort IMHO. 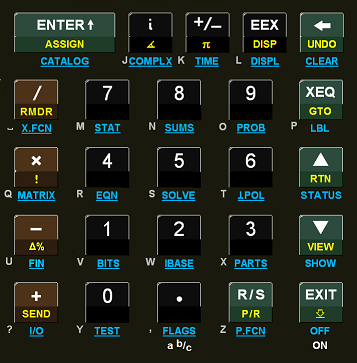 Given the recent left turn in the "keyboard layout" drama, how many people here are withdrawing interest in the calculator? ...how many people here are withdrawing interest in the calculator? Such "one-issue" politics are always much more emotional than logical. With respect to this continuing layout controversy, logic indicates that the ENTER key should be in column with the arithmetic operator keys because of its required frequency of usage with the arithmetic keys. One can also make an good argument that, for the right-handed majority, layout of these keys all on the right side is most efficient. HP's 49/50/Prime series have implemented that layout. The order of the keys is more arbitrary. I've purchased many calculators from many sources since my first in 1972. I never found one with the key layout that I would have chosen. In answer to your withdrawing interest question, had I adopted that "I'm now loosing interest because I won't have things exactly my way" attitude I would never have purchased anything after that Bomar 901B! There are plenty of things wrong with the key layout, LCD, and colors of the HP 42S, yet it remains my favorite HP calculator of all time in spite of those defects. I don't expect that the WP 43S will have what I'd consider a perfect layout, but judging from the WP 34S, its capabilities will grossly outweigh the trivial issue of which side I'd like the ENTER and arithmetic keys to be placed, and the order of the keys. How many are now willing to buy it who wouldn't have bought it with the previous layout? I would, with certainty. I like ENTER in column with arithmetic keys. The order of the arithmetic keys is much less important, though I'll admit that I really like the order as it appears on my HP-41CX, HP-67, HP-34C, HP-19C, HP-25, HP-35, etc. But I can adapt to anything that isn't too bizarre as long as the power behind the keyboard makes it worthwhile. But I can adapt to anything that isn't too bizarre as long as the power behind the keyboard makes it worthwhile. Thank you very much, Mike! You expressed exactly what I'm thinking. Eric, Marcus, Pauli, Richard and Walter: Please do it! -- "It�s always easier to ask forgiveness than it is to get permission." (Grace Hopper) -- Sadly, I can't support the development currently. But I'll buy at least two and make propaganda. Such "one-issue" politics are always much more emotional than logical. With respect to this continuing layout controversy, logic indicates that the ENTER key should be in column with the arithmetic operator keys because of its required frequency of usage with the arithmetic keys. Once you get away from using a single thumb, it is quite easy to see the merit in placing the arithmetic keys opposite of the enter key -- for the same reason the QWERTY and DVORAK keyboards don't have keys lined up alphabetically: faster input by pressing keys using the opposing thumbs every other button press (or opposing hands on a PC keyboard). So while it may seem "logical" from a one-handed pointed of view, it is quite illogical if you use two hands (thumbs, to be precise). The QWERTY keyboard layout was designed in the 1870s to "place commonly used letter-pairs (like "th" or "st") so that their typebars were not neighboring, avoiding jams. Contrary to popular belief, the QWERTY layout was not designed to slow the typist down..."
You would be in the minority these days. Look inside any classroom and you will see how the majority of calculator users hold their units -- it's the exact same way most of them hold their phones when they text. I am fairly sure that the education market is much larger than any other group of calculator users (as they would naturally form a smaller subset of that market). Contrary to popular belief, the QWERTY layout was not designed to slow the typist down, but rather to speed up typing by preventing jams. (There is also evidence that, aside from the issue of jamming, keys being further apart increases typing speed on its own, because it encourages alternation between the hands. The same principle would be true with the ENTER and arithmetic keys opposite each other. Such "one-issue" politics are always much more emotional than logical. During the first "poll wave" many people, including myself, contributed both emotional and logical. Finally all things were moved into the right places for the majority of contributors. And now the most important "one-issue", the key arrangement around the numeric keypad, was dropped by one of the developers only because he (or some of the other devs) want it in a specific way, not justified by any objective reason, but rather from an emotional point of view. So please don't blame people for being irritated from the developers seesaw. And about attitude: Why do you expect someone to spend much money for a (still hypothetical) calc he/she may be interested in but doesn't really _need_ , if the most important thing is not as he/she wants it to be? Speaking for me, I like the HP-41 keyboard layout, but I more like the Pioneers, amongst other things because of their keyboard layout, and for a new and yet-to-be-developed calc, I wouldn't want to revert to a keyboard layout (and order of the arith keys) like that on the HP-41. And worse, the order of the arith. 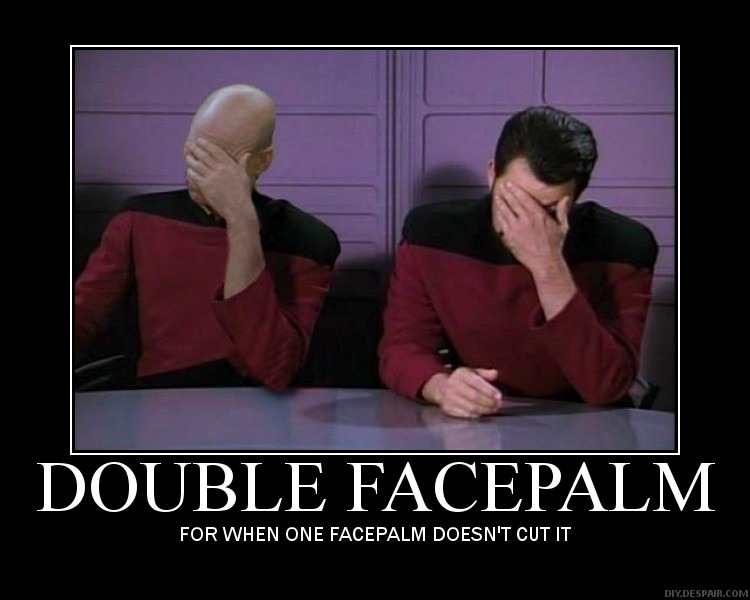 keys on the latest "proposal" would not even be compatible to that of the HP-41. That would be unnecessarily unwise IMHO. Edited: 21 Nov 2013, 4:26 p.m. I like ENTER in column with arithmetic keys. The order of the arithmetic keys is much less important, though I'll admit that I really like the order as it appears on my HP-41CX, HP-67, HP-34C, HP-19C, HP-25, HP-35, etc. But I can adapt to anything that isn't too bizarre as long as the power behind the keyboard makes it worthwhile. I agree with every point of this statement. The WP 43S would fall in line with exactly the models listed here and it would be wise to adopt their basic keyboard conventions. Just to clarify: my previous message about the "poll" wasn't sarcastic or critic in any way. I was honestly curious. Though I don't agree with the developers here, I still respect them for the project they're bringing on, and I understand that they want to just "move on" and do things their way. I think they're right in doing that. I am strongly right handed. When thinking about this and using different calculators back-to-back to try to understand my own preferences, I came to the following conclusion. 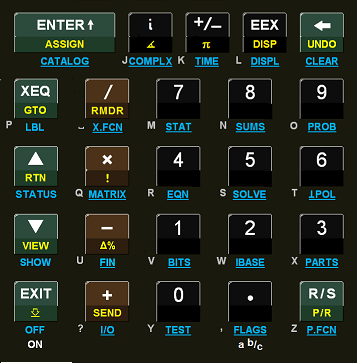 What I really like the most is having the number pad to the lower right of the keypad (like the HP-41). That positioning, without having anything to the right of the number pad seems to make it easiest to punch in numbers which probably accounts for most of my button presses. 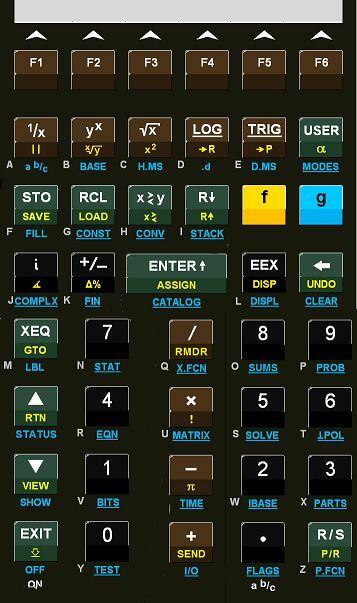 If the number pad is to the right, like on the HP-41, then obviously I prefer the operations on the left where I use my left thumb on them if holding the calculator in my left hand, which I commonly do. If the calculator is on the desk, then I just use my right hand for everything. On the calculators that have a column both to the right and the left of the number pad, I just seem to use my right hand for everything and not seem to use my left thumb very much at all. In that case I don't really have a strong preference for operators on the left or the right. I am used to having them on the right but might start to use my thumb if they are on the left. Would have to try it. I realize there is a certain symmetry to having the number pad centered, but there is precedence for asymmetric layouts. The fx-9860gII for example, which I have been using a lot for simple calculations, has the number pad all the way to the left. Change can be good. We progressed from rotary-dial phones to touch-tone. Better. Blackberry gave us tiny QWERTY keyboards instead of the letters on the number keys� better for e-mailing and texting. Then, the iPhone gave us a touch screen� better for Google and other distractions. These devices have evolved to be better at what we use them for; form followed function. However, is anybody here typing on a Dvorak or Colmak keyboard? Going out on a limb, I�ll ask why not, since either is arguably �better� than a QWERTY keyboard. For me, these are solutions to a problem that I don�t have; in this case, consistent and familiar are more important than better. Putting basic functions on the left and navigation and power on the right feels like a Dvorak solution. 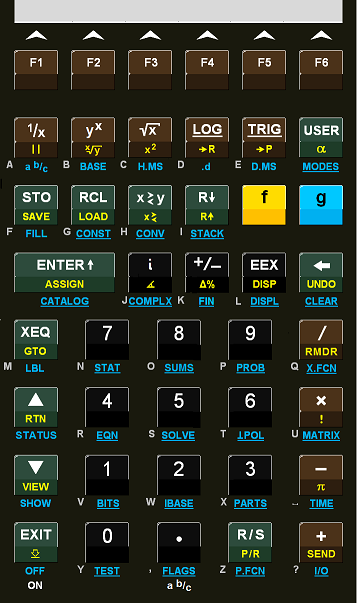 It�s a nice homage to earlier iterations of scientific calculators. Maybe it�s even �better.� But for daily use? What I do with calculator isn�t going to change, so form isn�t following function. Any potential �improvement� this approach offers is outweighed (for me) simply by it being different. Not really, I'm more conservative on this matter. Your initial layout in the first post of this thread with the modifications suggested by Bill Carter on the location of pi looks very good to me. If I had something to say in the final choice, this would be my vote. This right-hand side arithmetic operator layout looks very clear to me. The uneven arrangement of the alphabetic and misc characters might be improved by putting _ on the XEQ key, shifting the letters M, N ... X by one place so that X is then found on [Delta%]. If the arithmetic operators do end up going on the left, I suggest at least following the classic HP layout. There seem to be no compelling reason to introduce yet another layout for the brain to learn to discriminate as one switches between calculators. This right-hand side arithmetic operator layout looks very clear to me. The uneven arrangement of the alphabetic and misc characters might be improved by putting _ on the XEQ key, shifting the letters M, N ... X by one place do that X is then found on [Delta%]. If you thought it couldn't get worse than the layout from message #64, message #114 demonstrates the contrary. Edited: 22 Nov 2013, 7:47 p.m.